Seniors Anna Rackley and Lizzie Wrablica stand in front of a river. 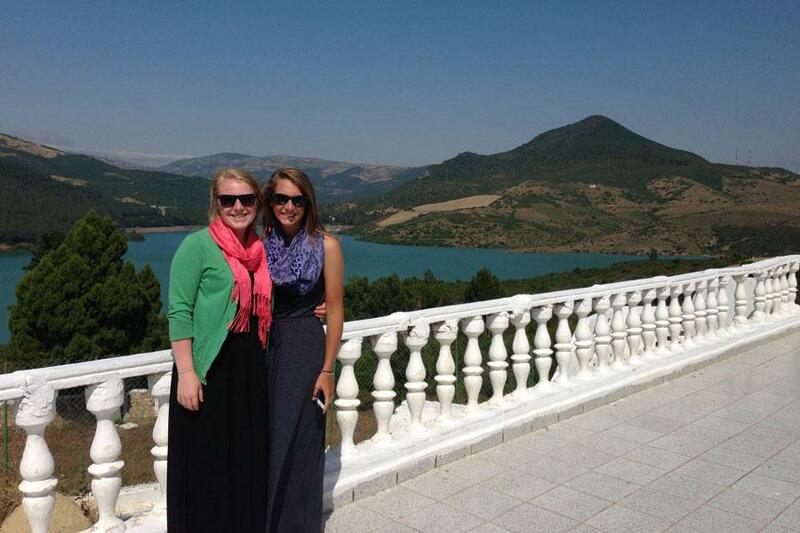 Rackley and Wrablica went on a two-week mission intensive to Spain, Morocco, Turkey and Germany this summer. Seniors Anna Rackley and Lizzie Wrablica witness cultural differences and experience God’s faithfulness. Senior Anna Rackley looks out the window of the car at the beautiful Moroccan mountains. One of the missions trip leaders pulls out his guitar from the trunk and starts playing common worship songs. Soon everyone in the car joins in, lifting their voices to Heaven in a country where the Christian God is forbidden. Feeling God’s presence and his spirit on her, Rackley sings even louder and relishes in his unlimited power. Rackley and classmate Lizzie Wrablica went to Spain, Morocco, Turkey, and Germany this summer on a two week missions intensive. Partnering with Global Intensive through Hillcrest Covenant Church, Wrablica and Rackley raised $2000 each after filling out an extensive application in order to attend. Unlike most missions trips, Global Intensive teaches young Christians to enter into a new society with an open mind and be proactive within a community without the sole purpose of evangelizing. Submerging yourself into different cultures and different people groups can be challenging, but sharing the gospel is well worth it. “Missions is so crucial, and it’s easy to forget just how many millions of people that do not know Christ or have not heard of him,” Rackley said. The intensive was what the name suggests, intense. Culture shock was very real to both seniors. Wrablica, along with Rackley, witnessed worship to the Islamic god at the Blue Mosque in Turkey, one of the most famous mosques for Muslims. “It was difficult seeing people praying to a god who isn’t described as loving and almost out of fear of the religion itself,” Wrablica said. To Rackley, Morocco was one of the most challenging and difficult cultures to engage. Understanding how different most of the world is from America was a life-changing experience, and Rackley and Wrablica felt God’s presence with them the entire time. “I believe God is calling me to missions whereas before I would never have thought I would be a missionary in a million years,” Rackley said. Being a proactive Christian and sharing the gospel doesn’t require $2000 and a two week mission trip. As Christians, we are called to share the good news wherever we go. Rackley hopes to go again next summer and has seen God work throughout the intensive.